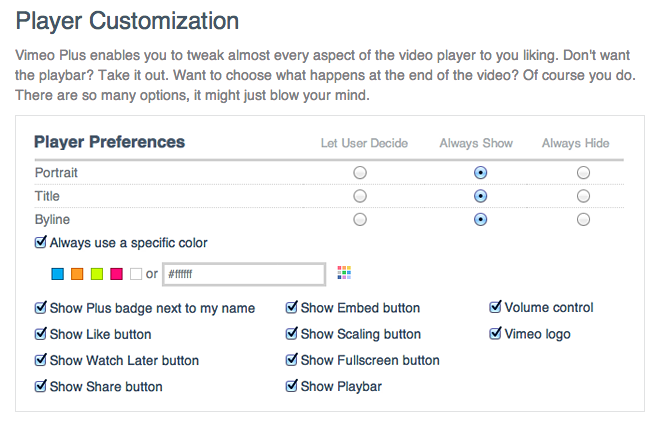 A quick and easy trick for controlling the appearance of the vimeo.com video player. Vimeo gives you various options when you manually generate the embed code on their website (font colors, showing or hiding of title, username, user icon). However, if you use WordPress and take advantage of the super easy one-line embed method, you don’t have access to those options, and you get the defaults (everything visible). If you frequently embed vimeo on your site — in my case, it was the solution used for the FABMIC website — you actually want both features: simple embed mechanism, and site-wide control of the player appearance. How to obtain this, if we don’t have full access to the code mechanism of the iframe (that’s how the HTML5 compatible player is embedded)? The solution: we can simply use jQuery to add the parameters that we need. Regarding the CSS selector (#content iframe): in our case, the vimeo embeds were the only occurence of an iframe that would show up inside the #content area. On the other hand, even if the script would get wrongly applied on some iframe, the parameters would probably have no adverse effect. I found your post onto the wordpress forum regarding how to remove title, author and image from video player. Could you please advice where to add this code into? If it’s just a few lines of code, you can safely add your script to the footer.php file in your theme. Add this code just above the closing </body> tag. Also, note that we place our script inside the “ready()” function. What about the share buttons, how to remove them? Another question: Would it be possible to remove share and all other things on the vimeo embed player as well? Unfortunately, those settings can’t be influenced by the iframe embed code. There’s an alternative that gives a lot more control: using the Vimeo API to query for the placeholder image, and generating the embedded player only when the user clicks on it.